This is my final Happy Valentines Day / Chinese New Year dual bento! I made two sweet potato tigers with nori and sesame seed detail, with a red pepper heart to show their love. Also in the box, which is a tiny bamboo steamer, broccoli, maroon carrots, yellow carrots, strawberry and red grapes. My boy brought a bunch of lay see and candies home from his class party, so I used some of them for the photo. So darling and radiant, sherimiya! Two happy tigers doubles the sweetness--with such skillful nori details! Wishing you and yours all good fortune and joy in the new year! So sweet and so cute! I love your idea to use the bamboo steamer, looks very oriental. Beautiful colors .. You are the best Sheri! 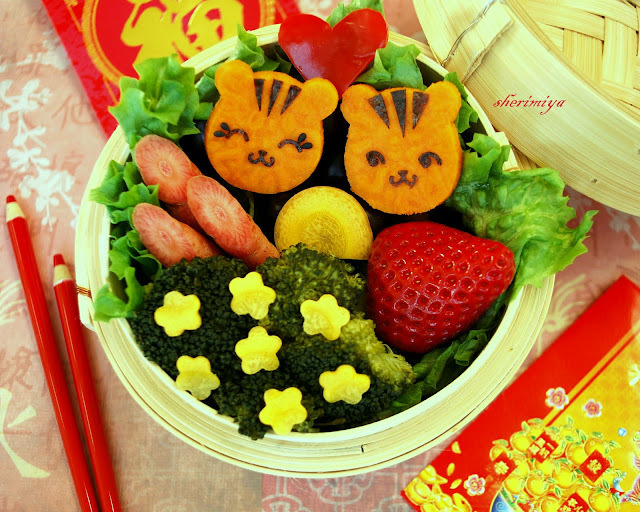 Heart healthy, CNY and Valentine's bento is TRIPLE adorable. oh wow love this what an adorable blog you have please do a guest post for my blog!! Aw, those tigers are sooooo cute! This is lovely - sweet potato is the PERFECT colour for tigers! Your bentos are fabulous! I love the nori details. You are so talented! Thank you so much for your sweet comments! Really appreciate your kind words and visit! Hope you all had a great Valentine and New year Day! Rebecca, thanks for the offer, I would love to! The tigers are soooo cute! 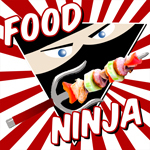 I stumbled upon your site from Bentolicious's page and I love your bentos. Will be coming back for more ideas as I just got back to the bento scene after a hiatus of 10 months! Thanks a lot! Thanks for visiting! Awww, they are so cute!